Brush Wizard: 2017 Year in Review! This year was the first time I was able to make it to Adepticon and GenCon. While at Adepticon, I was finally able to meet up with a bunch of friends from social media and hang out with them. It was a great time and I even put my hat in the ring at the Crystal Brush, even though I didn't manage to place. I was lucky enough to be hired by Ninja Division to help judge their Golden Kobold chibi miniatures painting competition at GenCon, which meant a free ride to GenCon 50! That was a great time, and I met a TON of industry folks. I got to meet all the guys responsible for Super Dungeon Explore, met a designer of RuneQuest and the designer and artist for Millenium Blades. Folks came by the booth while I was working and asked for painting advice and I was even pulled aside a couple times to give pointers to folks looking to get started with painting. That felt great! The Brush Wizard at GenCon 50, The Golden Kobold, GenCon 50! 2017 also saw the first time I'd ever been featured on the cover of a hobby related magazine, which was the (now sadly defunct) Golden D6 by Adam Jones. The Golden D6 was a hobby focused magazine that featured hobbyists like myself, and served it up as a place to find advice, tutorials and artwork from all of us. It reached up to 12 issues before Adam had to call it quits, due to personal reasons. But before it ended, I had Distracted featured in the magazine and the honor of having her grace the cover of issue 10. While the Golden D6 was a digital only magazine, I ended up printing the cover off and am still looking for a suitable framing solution for it. That's not all though. After having come back from Adepticon I had submitted the Deathwing Terminator Captain to White Dwarf, Games Workshop's hobby magazine. 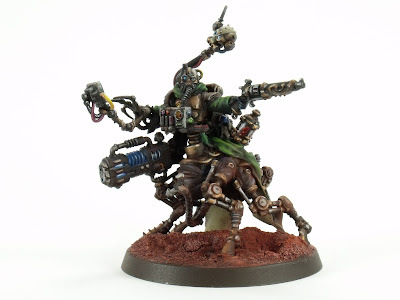 He was lucky enough to get featured in the Warhammer 40,000 30th Anniversary issue, in the Readers' Models section of the magazine. That was a huge check mark notched for me and I'm super proud of it. Especially since I'd never submitted anything to White Dwarf before. This year I joined forces with Sophie, of Hobbyistgirl fame, and we started streaming our painting on Twitch. Since we are in two different states, we have to use a work around to make it so folks can see both of us simultaneously, but it works for now. While streaming we found that conversing with the chat wasn't the best solution, since there's a delay. So, we started our own Discord server as well for folks to join in and actually talk with us while we paint. Of course, there's no way to get what the are saying to stream. But it is nice to actually talk without having to check the chat window all the time. I had a rough time coming up with new tutorials this year. But I did manage to knock out a few. One of which was a tutorial on metals, a culmination of my goal to improve my metal painting. One major improvement in the hobby department was the addition of a new desk and revamped hobby area. For my birthday, I decided to treat myself to a new glass topped L-shaped desk. This was followed by new drawer storage, a custom made Brush Wizard placemat, a custom Metal Man paint water mug (for metallic paint, obvs), a new Back 2 Base-ix paint rack system, new lights, a two webcams and a microphone! The desk was relocated from where it had been for the last 2 years and moved to the corner of my living room. 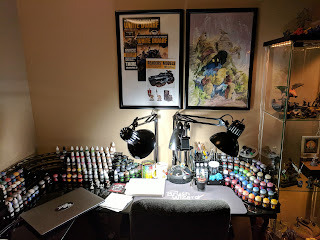 It's been a welcome change and makes my hobby area feel more like a studio and less like a messy table in the middle of the living room. This year, I started working on my first ever army for Warhammer 40,000. While I had bought it with the intention of playing 7th edition, that never happened. Once I went to Adepticon and met up with folks like Greggles, and Dan (and the rest of the Lonely Havocs crew), I knew I wanted to play at next year's Adepticon. These are the best pieces of the year, in no particular order. While I know it was made as a Christmas gift for my sister in 2016, the Cliffs of Insanity lead to one of the greatest moments of 2017. 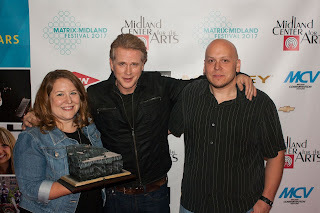 A few months after Christmas, my sister mentioned that Cary Elwes was coming to town for local event, where he was talking about the film,The Princess Bride. We were not only able to go, but thanks to our folks we were able to score VIP tickets, meet him and show him the diorama. Before the show started, we had many folks asking us about the piece and my sister would gladly show it to everyone and say "my brother made it!". After the show, we were ushered to the greeting area, where Mr. Elwes was waiting to greet people. As we stood in line, more folks were asking about it. It was a proud moment, and only slightly embarrassing. Finally it came time for our turn to meet Mr. Elwes, I let my sister go ahead of me, while she carried the piece and he started with his standard greeting, before noticing what she was carrying. He paused and uttered "well, what is this? This is fantastic! ", and asked to look it over. He held it, and gawked in complete awe of it. He tilted it, stared it and and asked me a bunch of questions pertaining to it. He asked if I did things like this for a living, and I replied that it was just something I do for fun. He replied "Well, you should, this is fantastic work!" I tried not to be embarrassed or overly excited by the whole thing. It was, without a doubt, one of the greatest moments of my life. Here we had a man, who is basically ultra famous, completely in awe of it and you could see his mind exploding. I'd never seen anyone as excited to see my work as he was. It was one of the best feelings I ever felt. In the lead up to GenCon and the Golden Kobold, I needed something to put in the display case and enter into the Open category. I originally didn't think I had the time to do something, but I squeezed this fella out anyway. Jack's base is notable, as it is the first real time I had tried sculpting anything from scratch. Before this, I had only done gap filling with green stuff. They could have turned out better, but I'm happy with them. Tabby is special, she was my entry into the chibi category of the Crystal Brush and while she didn't place she did make it into the web voting portion of the competition. That alone was a huge ego booster. She was a last minute paint job and I only had a few days to work on her before leaving for Adepticon. I wish I had had more time to work on her, maybe had done a little freehand on her cape. On the other hand everyone I show her to loves her and she made finals, so she's a winner in my book. This fella upped my painting game on so many levels. I dropped well over 100 hours into him for Crystal Brush and during it, I sculpted, freehanded and upped my skin tone, eye and contrast game. The end result is a piece that I am insanely proud of. He didn't make it far during the competition, not that I was surprised. That was the catalyst I needed to get me to submit him to White Dwarf, which he made it into for the Warhammer 40,0000 30th Anniversary issue. I've been working on a Adeptus Mechanicus army for awhile now. In Warhammer 40,000 7th edition I didn't need to run an HQ for my army. Since 8th edition dropped the need arose for my army to now have an HQ unit. While I do like the official Tech-Priest Dominus, I really wanted to make my own. Built with pieces from multiple Admech kits, he is the most in depth conversion I had ever done and I couldn't be happier with the end result. I can't wait to get him on the battlefield. 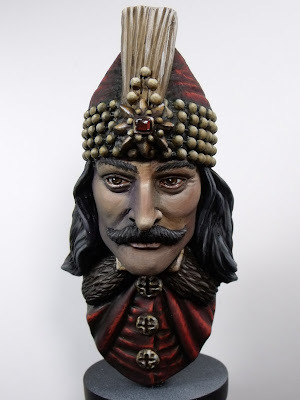 This year I finally tried painting a bust. When I saw this Vlad the Impaler bust from Black Heart Models I knew I needed to have it. It was a great challenge and pushed me in many areas. Overall, I'm really surprised and pleased with how well it turned out and I've itching to try another one. It was a great year on the hobby front, with new desk up grades, the beginning of our stream, conventions, getting published and impressing a celebrity. I'm almost surprised at how much awesome I managed to squeeze into this year! Its time to look forward to 2018, and I have some pretty solid ideas in mind already. That's a pretty impressive year. Your sister is pretty awesome. I'd be embarrassed too, but that's a killer story. I did see a HUGE improvement in your painting this year. I also love the Jack Scarecrow figure. Easily my favorite thing you've painted this year. Thanks buddy! It's been a great year this year. I'd definitely recommend Adepticon, it's such a good time and pretty laid back. I'll be there again next year and plan to do nothing but hanging out and playing 40k/board games. Cary Elwes was great to talk to and it was definitely the most amazing hobby related thing of the year. Especially because of his reaction. Yep! It was a fun project. But slightly rushed because I only had about a week to build it. Ended up fixing it up a bit before taking it to show Mr. Elwes, because u wasn't super happy with it.